Lightweight yet powerful, the BF60 has proven itself as both a fishing boat engine (aluminum bass) and a recreational outboard (small-centre consoles, inflatables). Enjoy best in class fuel efficiency along with the big performance that comes with BLAST Technology (Boosted Low Speed Torque). The BF60 does not come with a propeller. 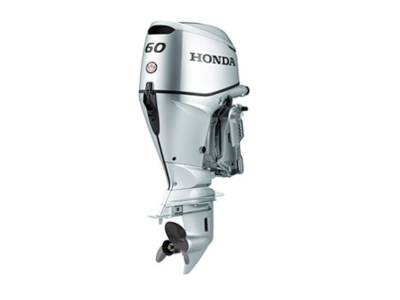 Please consult with your Honda Dealer for propeller application assistance. 998 cc / 61.0 cubic in. 2.70 l (2.40 imp. qt) with oil filter repl. 417 mm / 16.4 in. 521 mm / 20.5 in. Are you Interested in the BF60AK1LRTC? * Manufacturer's suggested retail price. HST and licensing fees not included. Does not include current promotions. Learn about our special offers to know applicable specials..